The summer warmth lingered longer than usual this year and November saw days brightened by a lemon sun hanging low in the sky. I enjoyed its presence, spending time sitting out in the garden, opening the windows to let the air flow through the house, taking lunchtime strolls. In this Indian summer I lost my sense of time; when the colder weather finally, and quite suddenly, blew in I felt a little disorientated, like waking up from a hazy dream. Is it really December? Christmas is on its way? Where did the time go? As the cold air touched my cheeks and fingertips and brought me back to the here and now I embraced the new sense of season I had. Gloves and scarves were taken out of their storage box, Christmas lights hung, gifts purchased and candles lit. And now I’m yearning for winter food and feel the need to bake, much to the delight of Rob and anticipation of my colleagues who have been badgering me for afternoon treats ever since they found out about my blog and book. And so I have baked. And baked. In fact, I have made two strudels since Sunday, having never made one before. Sugar and spice was what I needed and I knew that a strudel, with a sprinkling of festive warmth, would hit all the right spots. Having chosen my pud and looked up several recipes to get the gist I headed to the kitchen. If there’s one thing I really love in cooking it’s making something that doesn’t need to be bound by an exact recipe and allows me the freedom to play, which this certainly did. I’m never happier than when I’m opening my cupboards and adding a pinch of this, a dash of that, a spoonful of this and, oh, how about a dollop of that? Stirring, tasting, inhaling, like a white witch conjuring up a little magik. Having pottered and added the ingredients to my filling that I felt would arouse a sense of Christmas – ginger; cinnamon; nutmeg; maple syrup; brown sugar; clementine zest – I went to the fridge for the ready made pastry Rob had picked up for me. And then I discovered that he had accidentally picked up puff instead of filo. Ah. I was momentarily thrown but with nods of agreement from Twitter decided to use the puff pastry anyway. Besides, the filo pastry the majority of recipes call for isn’t traditional anyway – a particularly dough is meant for strudels – so it didn’t seem to matter too much. I waited with great anticipation as the strudel baked and the smells coming from the oven were certainly promising. I checked it after half an hour and saw that some of the juices were coming out but I wasn’t too concerned by this as in my research I found that this does sometimes happen. I just spooned them over the top, which turned out to give a great result. 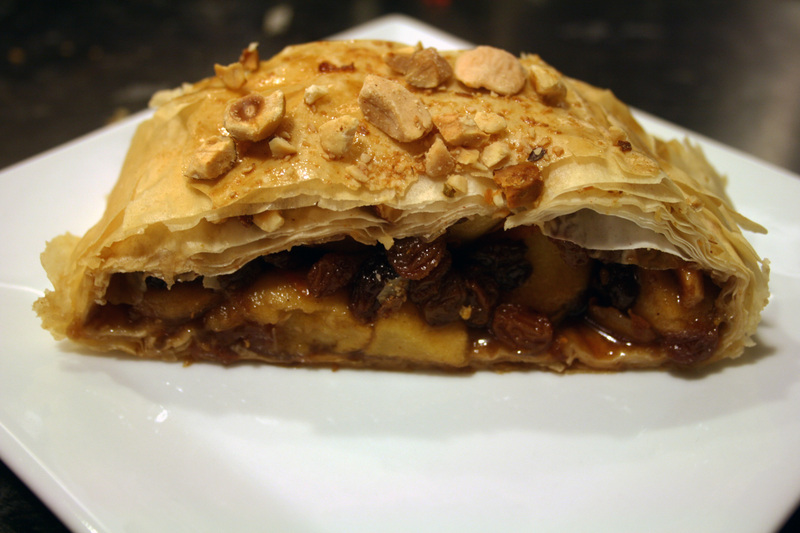 I was really happy with this strudel; it tasted as good as I’d hoped and was perfect for a winter evening pud. But sadly, the next day the pastry underneath went a little soggy from the juices which didn’t take away from the flavour but wasn’t what I’d hoped for. I was keen to try the strudel again with filo pastry and to see if I could cut down on the soggy pastry, so this time round I drained most of the juices from the fruit (but reserved them to spoon over the top) and the result was much better. I do think, though, that this is a dessert best served warm. Here is my finished recipe but please feel free to do as I did and go with your own sense of what will work for you. Start making this the night before you want to cook it. Put the sultanas into a lidded container and pour over the rum and maple syrup. Stir well to coat the sultanas then put on the lid and leave them overnight to soak up the liquid. The next day, when you’re ready to make and bake the strudel, preheat the oven to 180c/fan 160c. Take the lid off of the container holding the sultanas and give them a good stir. They should have soaked up all of the rum and be coated in the maple syrup. Transfer them with the syrup to a large bowl and add the apples, spices, sugar and orange zest. Give it all a good stir. Line a large baking tray with baking paper and then lay one of the sheets of pastry over it. Carefully brush the pastry with a little of the melted butter then lay over another sheet of pastry directly on top and brush this sheet with a little more of the butter. Repeat this until half of the pastry has been used and then sprinkle some of the crushed nuts over the pastry, reserving some to sprinkle over the top. Continue laying the sheets of pastry on top, brushing with melted butter, until all of the pastry has been used. Next drain the fruit mixture of excess juices, reserving them for later, and lay the fruit down the middle of the pastry, lengthways. Tuck the shorter ends of the pastry over the fruit and then wrap the longest pieces over the top of the fruit, completely covering it and making a sausage shape. Carefully turn it over so that the pastry joins are on the bottom. Brush the top of the pastry with the reserved juices and then sprinkle over the remaining nuts. Bake the strudel in the oven for 30 minutes and then check it. If any of the juices are leaking out spoon them over the top. Bake for a further 5-10 minutes until golden. Allow the strudel to cool a little and if you like you can dust it with icing sugar. Slice and serve it warm with a little whipped cream or ice cream, or serve it cold the next day. So nice to see you back posting, and to read you again. Recipe looks great, both puff and filo would work for me (former wouldn’t last long enough to get a soggy bottom on my watch). I ditto what Matt says! Lovely to see you back again and what a lovely piece. I love the spice combination . . . although it might be because today I have just baked two stollen and my house is filled with the most amazing Christmas spice aromas! 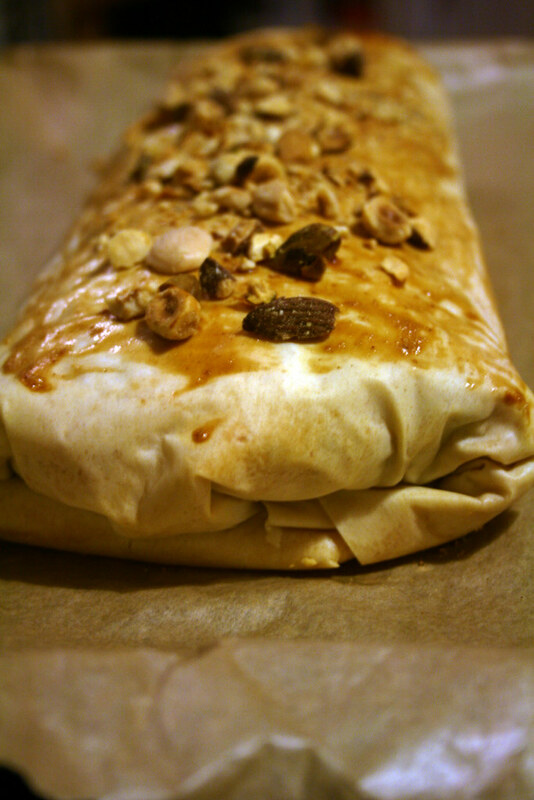 I don’t know much about strudel, but I do know that those pictures look good enough to eat. Wow! This dish looks kinda like baklava to me…is strudel always made out of filo pastry? Matt I – thanks, it it’s good to be back! Rachel – I love those Christmas aromas. I’m so happy that you like the book, and how exciting that it’s joined the library! Thanks for letting me know. Matt – There is a particular pastry that is meant for strudel but I think filo is generally accepted. This looks just gorgeous – I’ve never made one before but I absolutely love it. It reminds me of a holiday I had in Austria about 10 years ago. My friend and I would always stop in a cafe for Strudel and custard (or icecream) mid afternoon! I’m *so* making this on Sunday. I love Apple Strudel, and yours looks delicious. These look delicious! Been searching for inspiration and these definitely look worth a try…!